Dell is surely soaking up all the adulation from its handsets the last few months, but it doesn’t mean that they’re simply content at riding into the sunset with their existing portfolio of handsets. 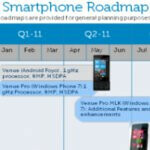 Today, we’re greeted with what appears to be a leaked slide showing off Dell’s 2011 Roadmap – and it shows quite a few upcoming devices that will undoubtedly get you excited. The first new device on the slide is none other than the Dell Wrigley which is looking to ready in time for July 2011 and packs yet another punch for their Windows Phone 7 camp. Definitely considered being a high-end device, it’ll feature a 4” WVGA display, 8-megapixel camera, 720p video recording. 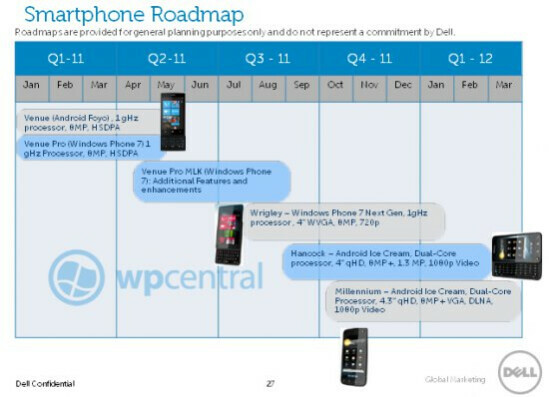 Looking into it more, the slide reveals that it’ll be packed with “Windows Phone 7 Next Gen” which is believed to be none other than the upcoming big update for WP7. In other related Windows Phone 7 news, the “Dell Venue Pro MLK” is found on the slide launching some time in mid-April with the tag line of having “additional features and enhancements.” From the sounds of it all, MLK is believed to stand for “Medialess License Kit” which means that it’ll more than likely be related to the big Windows Phone 7 update coming in March. And on the Android side of things, we find the Dell Hancock coming around in September packing some impressive specs under it hood – such as a dual-core processor, 4” qHD (540 x 960) display, 8-megaixel camera, 0.3-megapixel front-facing camera, 1080p video capture, and will be running “Android Ice Cream.” Moreover, it seems that it’ll be packing a landscape style keyboard as well from the looks of the rendered image found on the leaked slide. Not stopping there, we finally have the Dell Millennium which will land around Q4, which is seemingly quite some time away from now, featuring some impressive hardware as well. Similar to the Dell Hancock, sans the keyboard, it’ll feature a 4.3” qHD display, dual-core processor, Android Ice Cream, 8-megapixel camera, VGA front-facing camera, and will have DLNA support. Rightfully so, we’re going to see some focus on Windows Phone 7 since Dell has been seeing some huge demands for the Venue Pro. And with good buzz surrounding that device, it’s only fitting to see them coming strong from the start this year. However, it seems that we’re going to have to wait an extended amount of time before seeing some of their Android handsets – meaning you’re going to have to choose between devices like the Dell Venue and Streak in the meantime.